measurement range. 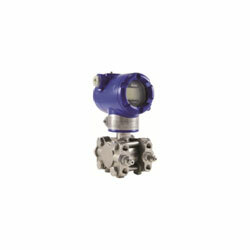 Optionally, a gauge pressure configuration is also offered. The transmitter transmits a 4 to 20 mA or digital output signal, as applicable, using FoxCom, HART, or Foundation Fieldbus communication protocol for remote configuration, calibration, and monitoring. Silicon strain gauge sensors successfully fieldproven in many thousands of applications. Wide measurement spans from 0.63 kPa to 14 MPa (2.5 inH2O to 2000 psi) using sensors having 80:1 turndown capability. Digital precision, stability, and resolution ensure premium measurement performance with linear output accuracy of ±0.025% of calibrated span for spans >10% of URL. Transmitter available with traditional or low profile transmitter structures (see photos above). Local configuration available with the optional LCD Indicator with on-board pushbuttons. Simple sensor packaging with very few parts achieves exceptionally high reliability. Can be provided as a sealed measurement system with numerous configurations of direct connected or capillary connected seals available. Durable aluminum or 316 ss housing available; both meet NEMA 4X and IP66 ratings. Industry Standard 316L ss offered for sensor wetted parts materials. Complies with applicable EMC and PED European Union Directives. See inside pages. FOUNDATION Fieldbus versions are FISCO and FNICO compliant.